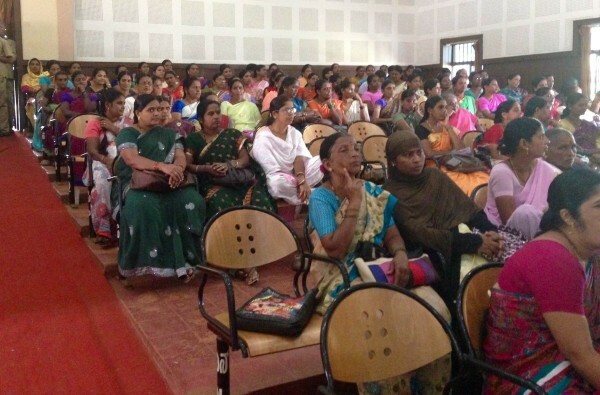 It was very Heartening to see Anganwadi workers, volunteers of Self Help Groups, NGOs, college students at the Smart City Belagavi Citizen Engagement Programme held today by the City Corporation at the Kumar Gandhrav hall. The program has to be conducted as per the guidelines of the smart cities challenge and the same was kicked off today in a very smart way, one must mention, albeit ironically. There was a lot of confusion to begin with as the Press Information Bureau already had its 3-day Mass Information Campaign at the same venue. Many citizens who did turn up were confused if the smart cities program was there or was it somewhere else. Both the banners of the programs were seen on the stage. Anganwadi workers, volunteers of Self Help Groups, NGOs, college students were part of a awareness rally of the various govt schemes and opportunities provided by the govt but they became a captive audience of sorts for the Citizen Engagement Programme. There was a time when the hall was full to capacity and the members of the real estate developers, architects, structural engineers had to stand and wait outside the hall to get themselves a seat. Then in a smart move a few of the students were asked to vacate the hall and thus make way for them. G Prabhu Commissioner City corporation gave a detailed one hour presentation on the Smart city concept but we were again amazed to see that no interaction was done after the presentation. We had hoped for some kind of interaction of the citizens and the officials. Each one was handed over a form which they could fill and drop in the suggestions box of their smart idea for Belagavi which was only in English.